Every actor’s worst nightmare is forgetting their lines. Just imagine it: you’re standing in front of a crowd of hundreds, deep into the Second Act of The Importance of Being Earnest and suddenly, your mind goes blank. The only sound you hear is the nervous beating of your heart. Luckily there’s usually a director waiting in the wings to whisper your line to you. If only social customer service agents had it so easy. But then again, the title of Oscar Wilde’s famous play offers a great lesson for contact centers: it’s more important to be authentic, to be human and personalized, than it is to flawlessly deliver a customer service script. With an increasing number of companies competing on customer experience — which essentially means competing to deliver the most authentic experience to customers who increasingly demand tailored service — it’s time for contact centers to ditch the script and personalize real-time social customer service. Here are four ways to make that happen. The first two concern agent behavior, while three and four focus on technology and social customer service software. Social customer service KPIs always seem to be a controversial topic, and one that can give insight to the primary focus of a given contact center. Many contact centers emphasize first-response time (FRT), meaning the time it takes to respond to a customer’s query. The idea is to keep FRT as low as possible. While that may seem like a noble goal, it’s often a missed opportunity for a meaningful customer connection. FRT emphasizes contacts over results, meaning it’s possible to keep FRT down without actually solving any customer problems. Customers appreciate agents who emphasize results on first contact rather than speed, meaning they won’t mind waiting a little longer if they only have to ask once. How to do it: Emphasize first-contact resolution (FCR), and enact an “ask once” policy that’s focused on results, not just speed. Think back to our dramatic example from the beginning of this post. An actor doesn’t change his lines from night to night, but depending on the size of the venue, they’ll certainly modulate the way they speak. Performing in a neighborhood theater? A subdued approach might work best. Performing in a stadium? Better project that voice! It’s the same with social customer service. Agents need the freedom to adjust their tone depending on the customer and the situation. While it’s certainly useful to give new agents some basic guidelines for customer interactions, I’ll always insist that the more personal the tone, the better. That includes using first names and informal language when appropriate. But it’s more important to match the customer’s tone. Be fun and friendly if they are, or more detached if that’s how they’re presenting themselves. An agent who is sensitive to the customer’s tone is more likely to seem empathetic and connected to the customer’s needs. customer’s tone of voice and match it whenever possible. While the invention of social customer service has allowed companies to vastly streamline their operations, providing potentially faster and more efficient customer service to a growing number of customers, it has also erected a sort of digital barrier between the customer and the service agent. In the old days when you had a problem with something you’d purchased, you simply marched down to the shop and sorted it out with the clerk. Now when you contact a brand there’s no guarantee you’re actually talking to an employee, let alone someone on the same continent. For brands that want to provide personalized social customer service, it’s more important than ever to break down that digital barrier and establish real human connections. Agents who know more about their customers will be able to appeal to shared interests and turn the service experience into a real conversation between two individuals. And that authenticity is what customers crave. customers from across the web, then utilize that information in service interactions. People who go to the theater want to see a play, not a movie. Customers who contact a brand on Twitter want to solve their problem on Twitter, not be told to send an email or make a phone call. One surefire way to alienate a customer is to make them channel hop, or tell them to contact you on a different channel from the one they’ve used to get in touch. It’s always a good idea to stay in the channel the customer prefers, if at all possible. customers will greatly appreciate brands that can take care of their problem without a series of unnecessary steps. Customers choose particular channels for a reason. Respect their choice and communicate the way they want to. to contact you somewhere else. These four ways to personalize real-time social customer service have to do with changing the behavior of contact center agents and utilizing the right technology. 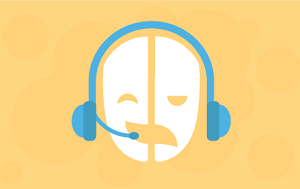 With powerful social customer service software, contact centers can revolutionize the way they serve customers, making personalization and human connections a constant occurrence rather than an ideal to strive for. Social customer service software that streamlines the process, tells agents more about their customers and monitors customer conversations across digital channels can make the job that much easier. Think of this software as a digital director waiting in the wings, not to feed agents their lines, but to give them whatever help they may need. The end goal isn’t a perfect performance but personalized social customer service that will lead to increased customer loyalty and more rave reviews. This article was contributed by Stephan Delbos, a social customer service expert from Brand Embassy. This entry was posted in Articles, Best Practice, Tips and Tricks and tagged 4 ways to personalize online support, how to personalize customer service, online support personalization, personalization in customer service, personalizing live support. Bookmark the permalink. But as its with so many different things in life, when something doesn’t make sense, it should be changed. Then analysed and compared with past. I am confident that large companies following the suite of small and more flexible businesses should ditch the scripts in contact center and empower agents to be more human again. Let’s see if customers will appreciate it! Thanks for your feedback, Vit! You make a great point about the high turnover among customer service agents. In many cases that certainly does lead to hesitation by the company to put so much power in the hands of the agent. But yes, as you said, when things don’t make sense, they should be analyzed and changed. Today’s customer wants a personalized and tailored approach to service that simply can’t happen if agents aren’t empowered and given freedom. I agree with you absolutely, Vit. It seems though that in life things which are more natural and simple are priced higher and almost impossible to get these days. We value human connection, but most companies fear to give this kind of freedom to their employees. It is cheaper for them to give employees a script and ask to follow it. They feel more secure this way, but it comes at the cost of customer satisfaction. I believe that both scripts and free form communication should go together. It may not be necessary to discard scripts completely, but they can be used as a tool for learning and establishing a certain degree of professionalism in new employees. Great post. I wonder if there is a link between the staff turnover and imposition of scripts for call handlers. Stifling creativity is probably not conducive to job satisfaction and if people are unhappy in their work they eventually leave. While allowing people to have genuine conversations with customers may need additional investment in training and quality assurance perhaps this would be offset by reduced recruitment costs? Might there also be a performance bonus with happy motivated staff performing better across the piece, showing more commitment and flexibility? Interesting Article. I understand why the employers are driving towards trying to control the narrative. In order to personalise I believe that the company has to know the customer. You made the valid point about engaging in the channel in which the customer interacted. What if they have browsed and interacted with you on various channels? The information needed to personalise the interaction is there and can be given to the agent in real time allowing them to interact in a intelligent. Its important to have that human touch but I think more importantly we should anticipate the customer needs and get ahead of that call or tweet. Thanks a lot for sharing such a informative and descriptive article regarding customer service . As i work in customer service company and i need a guidance how to tackle a customer and got some important tips from your article thanks a lot once again and keep sharing article and blog post regarding customer service so that we juniors can develop a high skill . Thank you for your feedback, Frazer.